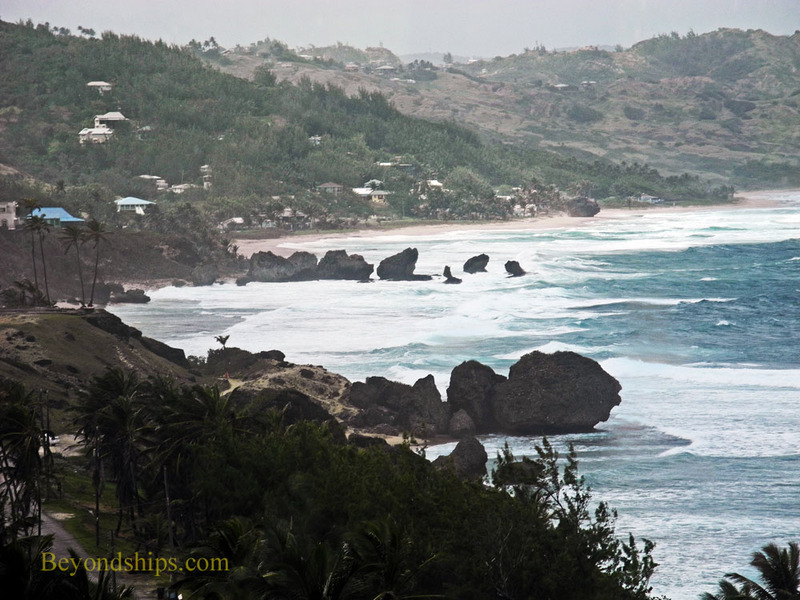 Bathsheba beach is one of the most famous beaches in Barbados. However, it is not a beach for a leisurely swim. The waves rolling unobstructed across the Atlantic from Africa make it too rough and create undertows that render ocean swimming prohibitively dangerous. At the same time, they make the beach a place of unique natural beauty, sculpting the coral outcroppings so that they look like boulders perched on pedestals. The name of the beach derives from the biblical figure, Bathsheba who was said to bath in milk in order to preserve her beauty. With its turbulent waves, the water at Bathsheba beach is often white with foam and thus looked like a milk bath to early settlers although, as noted above, this is not a place for bathing. This is not to say that there are no water sports at Bathsheba. Indeed, the area has hosted expert surfing competitions. Also, people go wading in the tidal pools along the beach. However, what attracts most visitors is the scenic beauty and the fresh invigorating air. The beach itself is sandy with the occasional pile of stones that have been shaped into balls by the sea. Just off the beach are shade palms and other trees. Visitors can access the beach via a park in the center of this small fishing village. Nearby are restaurants and other places to get refreshments.